Mississippi State has played 110 seasons of college football. Jack Cristil called 58 of ‘em. He’s called, I think, 54 seasons worth of basketball, including the reign of legendary Babe McCarthy. Cristil has pointed out what he referred to as the patented Kentucky Wildcat karate chop defense on the court and predicted another Blake McAdams shanked punt on the field. He’s seen some good, a little bit of great, but a whole lotta bad. Jack was so damned good that opponents’ fans rave about his calls. But even as he slowed down in the past few years, Jack Cristil is Jack Cristil. You could spin the radio dial (back when that actually involved rotating more than a piece of plastic) and his voice would bark out at you from the static. When Dudy Noble, the guy who the baseball field is named after, hired him, he said tell people the score, who’s got the ball, how much time is left and cut out the bull. I’ve heard that anecdote many times over the years, but next time you’re listening to a radio broadcast of a game, use your watch and see how long some play-by-play guys go without giving basics like the score. Here’s hoping Jack Cristil has a long, happy retirement. That’s he’s able to enjoy winning Mississippi State sports for a long time without having to work for it. He’s worked long enough, and Bulldog fans appreciate every moment of it. We’ll miss “He cannot go!” and “The ball sits equidistant from the sideline stripes.”. You can wrap this career in maroon and white. The urge, shall we say, is still there for Jack Cristil. 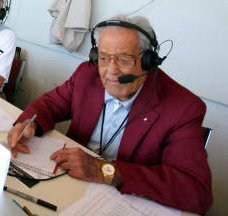 The longtime Mississippi State broadcaster was hospitalized five days last month with pneumonia. He’s not sure how he got it; the pneumonia vaccine and booster apparently weren’t enough to prevent it. Since that Tuesday between the SEC basketball tournament and the NCAAs, Cristil hasn’t smoked a cigarette. Not that the urge has gone away, as we said. “Not a day goes by that you couldn’t smoke one long as a football field,” he said from his Tupelo home Wednesday. That’s to be expected of a guy who said he would smoke a carton of cigarettes every seven or eight days, feeding a habit he picked up in the military in 1943. I joked with folks that I had seen Cristil many times in the press box at Scott Field, but that I hadn’t had a long conversation in that setting because I was always between him and a smoke break. By hook or crook, he was going to light up and get that nicotine fix for the second half. He won’t give himself full credit for quitting, though. Cristil said he’s doing better. The biggest problem he’s having is regaining his strength. But he knows his own perception of how fast he should be back mowing his lawn is different from reality. He’s not, he admits, 21 years old anymore. For the record, he’ll turn 80 in December. A conversation with Cristil is like talking to your radio and getting a response. When he says, “I’m having a little trouble getting my strength back, but basically doing OK,” you anticipate hearing the phrase “fighting hammer and tongs.” It’s not quite like that, but pretty good nonetheless. Getting well is simpler than that. He isn’t quite back to getting his yard work done, yet. He’s not got a meticulously kept yard filled with wonderful plant life. Weeds, he says, make up the bulk of the flora out front. Cristil said this bout with illness hasn’t changed his broadcasting plans, but mainly because there aren’t any to change. It doesn’t sound like he’s ready to wrap his career up in maroon and white, though. I’m sure Cristil enjoyed himself on State’s run to the 1996 Final Four, but this has gotta be one of the highlights of his broadcasting career. Lord knows it still holds a big place in the hearts of Mississippi State fans.